Olivier Award-winning actor Gavin Creel will ring Broadway's doorbell beginning Jan. 6, 2015, as Elder Price in the Tony Award-winning hit musical The Book of Mormon, producers announced Dec. 4. Creel, a two-time Tony Award nominee, launched the U.S. national tour of The Book of Mormon as Elder Price in 2012. He repeated his performance in the original London production of the musical, earning the 2014 Best Actor in a Musical Olivier Award. Creel was last seen on Broadway as Claude in the Tony-winning revival of Hair, a role he repeated in London. He has also appeared in Thoroughly Modern Millie, La Cage aux Folles, Mary Poppins and the world-premiere musical Prometheus Bound. Creel succeeds Nic Rouleau, who will play his final Broadway performance as Elder Price Jan. 4, 2015. Rouleau is departing the Broadway company to repeat his work in the London production of the musical beginning Feb. 2. 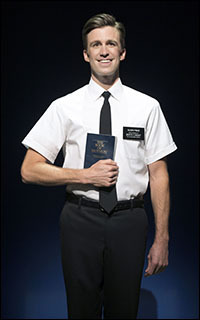 The role of Elder Price was originated on Broadway by Andrew Rannells, who earned a Tony Award nomination for his work. "South Park" creators-writers Trey Parker and Matt Stone, and Tony-winning Avenue Q songwriter Robert Lopez collaborated on the script and score to the musical, which earned Tony Awards for Best Book, Best Score and Best Musical. Co-directed by Parker and Casey Nicholaw, The Book of Mormon opened to critical acclaim March 24, 2011, at the Eugene O'Neill Theatre. Both earned Tony Awards for their work. The Book of Mormon has set design by Scott Pask, costume design by Ann Roth, lighting design by Brian MacDevitt and sound design by Brian Ronan. Orchestrations are by Larry Hochman and Stephen Oremus. Music direction and vocal arrangements are by Oremus. The Book of Mormon also picked up Tony Awards for Best Direction (Parker and co-director/choreographer Casey Nicholaw), Best Performance by a Featured Actress (Nikki M. James), Best Orchestrations (Larry Hochman and Stephen Oremus), Best Scenic Design (Scott Pask), Best Sound Design (Brian Ronan) and Best Lighting Design (Brian MacDevitt).